Of course, the first step would be to know more about the contractor before you hire them. Know about their certifications, expertise, and experiences. See to it that the contractor is fully licensed and insured. The license shows that contractors have taken an exam and proven they know building codes and processes. The insurance secures that you are not to be held liable should any untoward incidents happen during the project. Also, choose a contractor with a local address and phone number. This way, you can easily contact them if problems arise after the project. The contract should cover all the details about the project and everything that has been agreed upon – costs, br ands of items being installed, project time frames, etc. The labor warranty should be part of the contract. After the repairs have been completed, most reputable contractors will return to the home to make sure the window is working properly and thatthere are no further damages. If any damage occurs within a week of repairing a broken window, the contractor will repair it with no extra charge. You can either check out the contractor’s website to know more about the products and services they offer or you can visit the Better Business Bureau or Angie’s List to read the reviews. You can also ask the contractors themselves for references and ask their previous clients about the recent job the contractors have done for them. 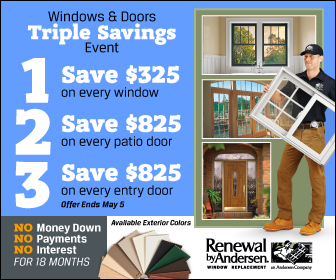 Get started on your home improvements today by calling Renewal by Andersen® of St. Louis, the trusted Chesterfield Missouri windows company. If you want to know more, just give us a call or browse through our website.